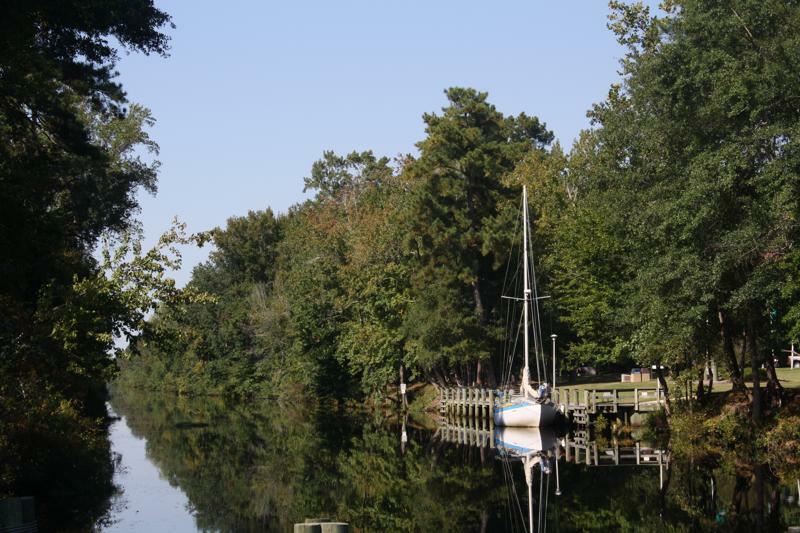 For our third and final stop along the Dismal Swamp Canal tour we traversed a whopping five miles from the Feeder Ditch and docked Rode Trip at the Visitor Center dock. From land this is a busy rest stop along U.S. Route 17 which runs parallel to the canal. The North Carolina Travel & Tourism Center provides ample information about sightseeing in North Carolina, maintains a cruisers’ book swap, and houses public restrooms (no showers and unfortunately I didn’t quite fit into the sink). The Travel & Tourism Center also offers free bikes that you may use on the well maintained bike path that runs parallel to the canal on the U.S. Route 17 side. 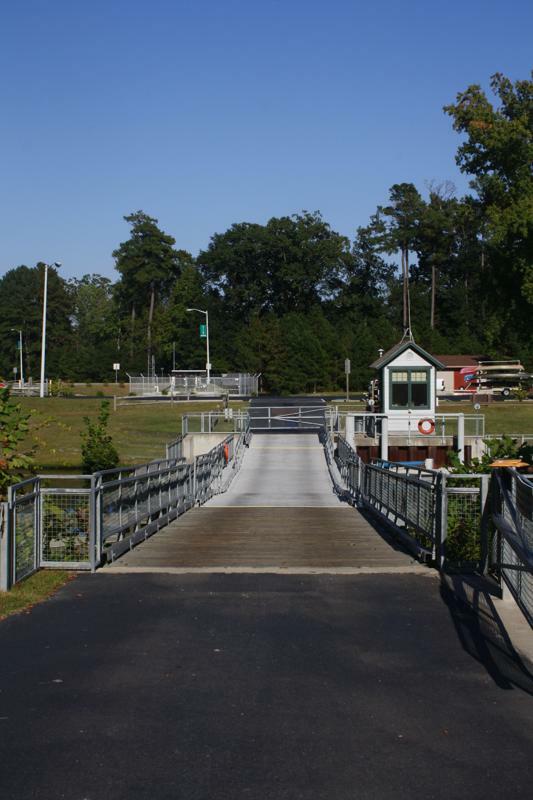 A pedestrian bridge crossing the canal is the gateway to the Dismal Swamp State Park. The State Park rents bikes and kayaks. 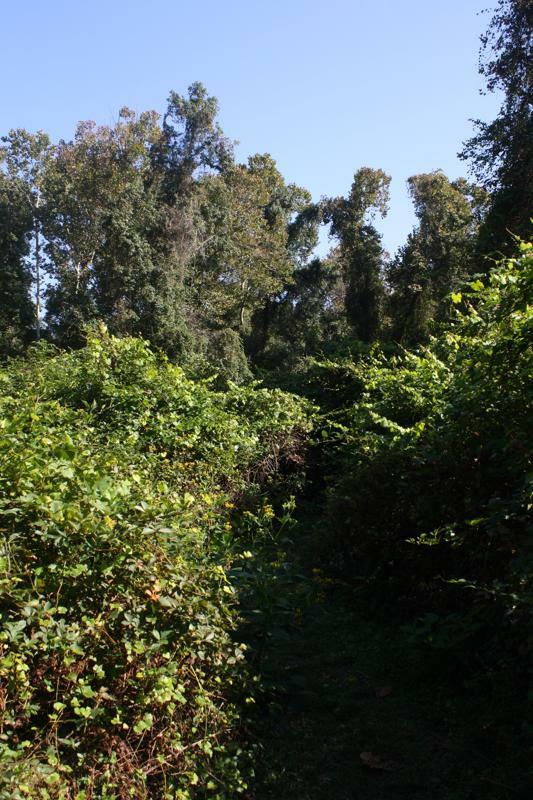 At the Dismal Swamp State Park Visitor Center you’ll find several informative exhibits pertaining to the history of the Dismal Swamp and pertaining to the wildlife found in the swamp. No worries for us boaters, the pedestrian bridge is raised on command when boats pass through; typically the operator sees the boat and opens the bridge. After a thorough read at the State Park Visitor Center, Brian and I took to the trails. We had one goal: find the paw paw. 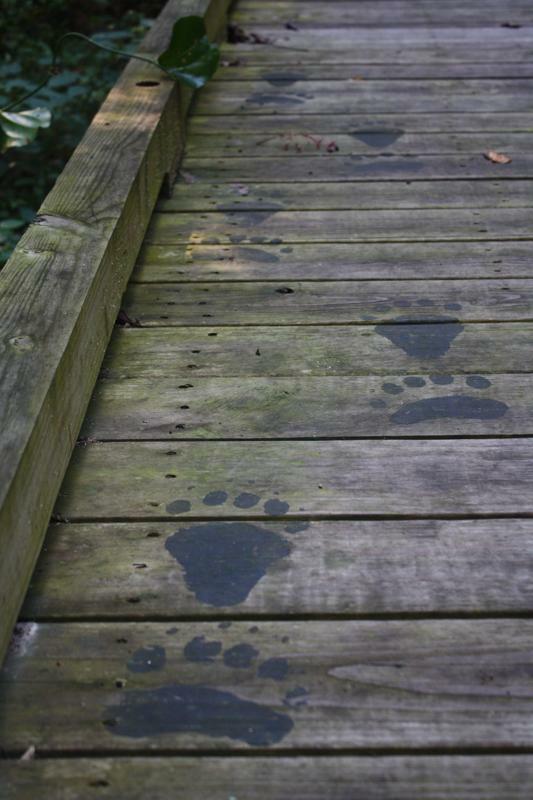 We started on the Boardwalk…is this the paw paw? No! These are the paw paws of a Black Bear. 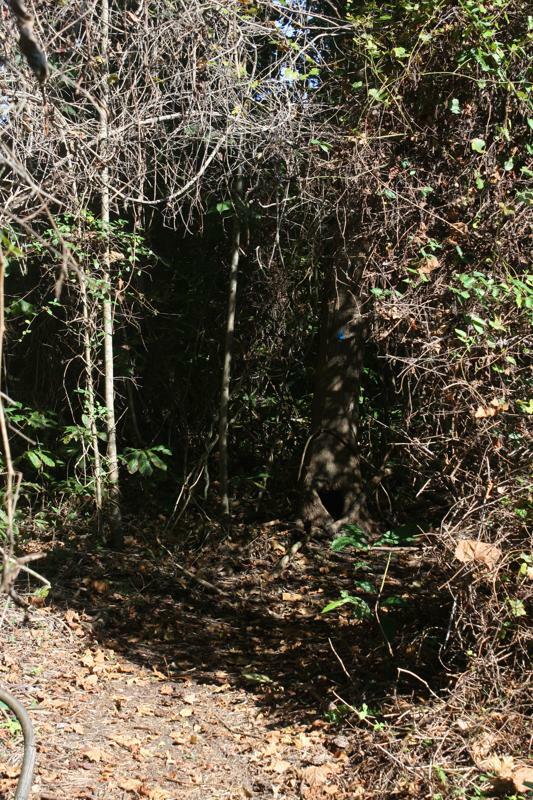 There are approximately 350 Black Bears that reside in the Dismal Swamp Wildlife Refuge. We moved on to the Supple-Jack Trail keeping a keen eye through the thick vegetation on the lookout for bears. Through the field there were no paw paws. But we did stumble upon this unique pod; the interior of which seemed to resemble dried out grapes. 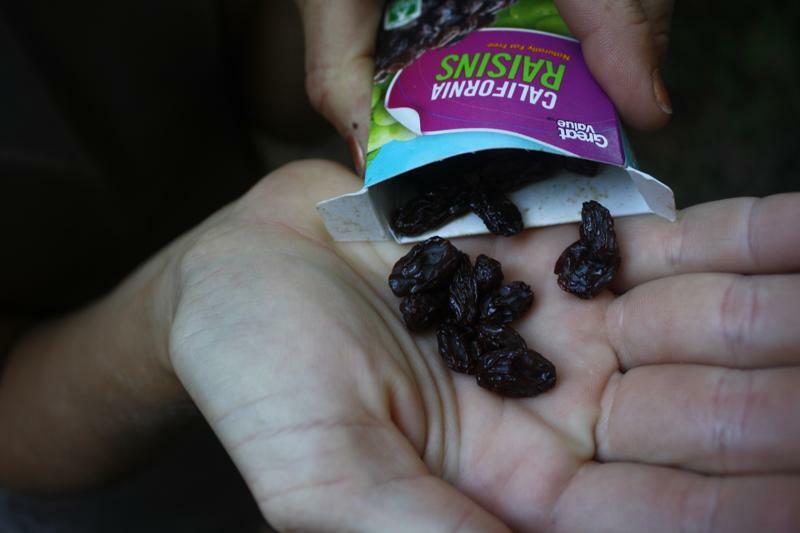 There were plenty of grape vines along the Supple-Jack Trail but we never did see any of the vines with the prepackaged raisins. Finally, there on the ground along the trail we found our first paw paw! 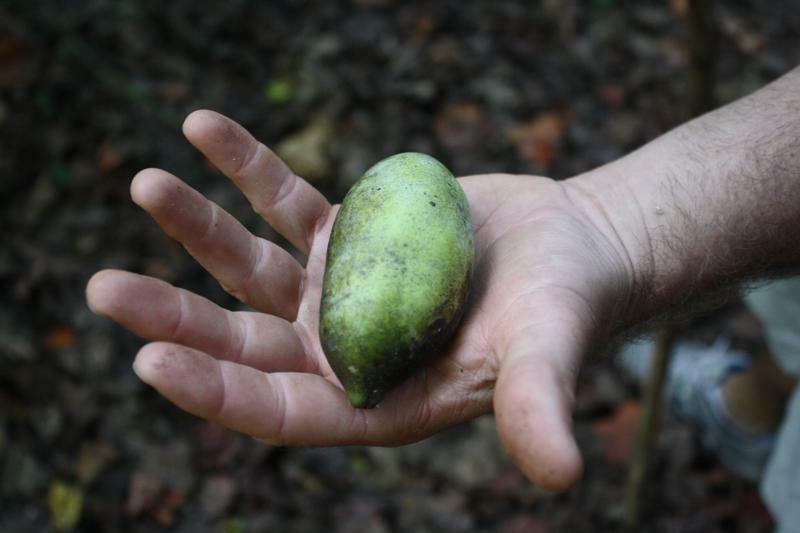 The paw paw is the largest, indigenous fruit in North America. It is edible. 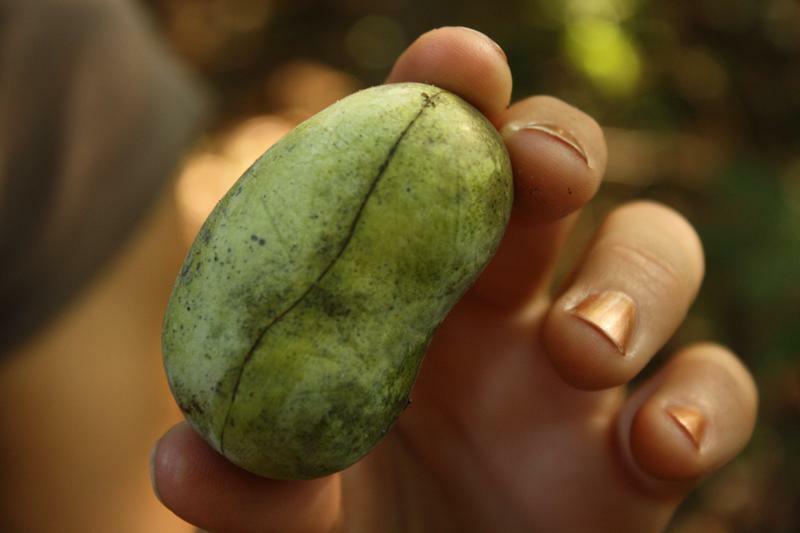 Paw paws have a consistency similar to that of a banana. The thin skin is easy to peel and the soft fruit easily splits apart. They are delicious! 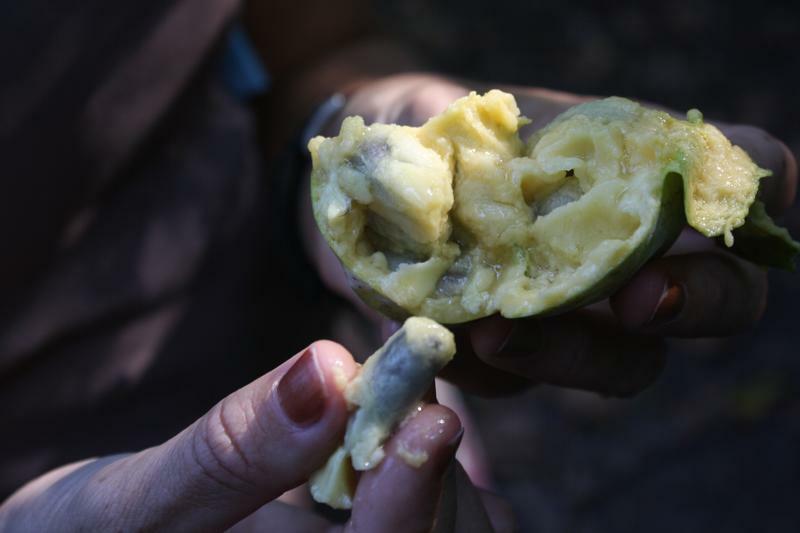 Having a very tropical flavor, we would describe the paw paw’s as a combination of mango and banana. The search for the paw paw was a success! And we had a scrumptious treat along our hike. Back aboard Rode Trip we had several neighbors dock at the Visitor Center for the night and we got to chatting right away. It sure was nice to end our tour with a bit of story swapping! 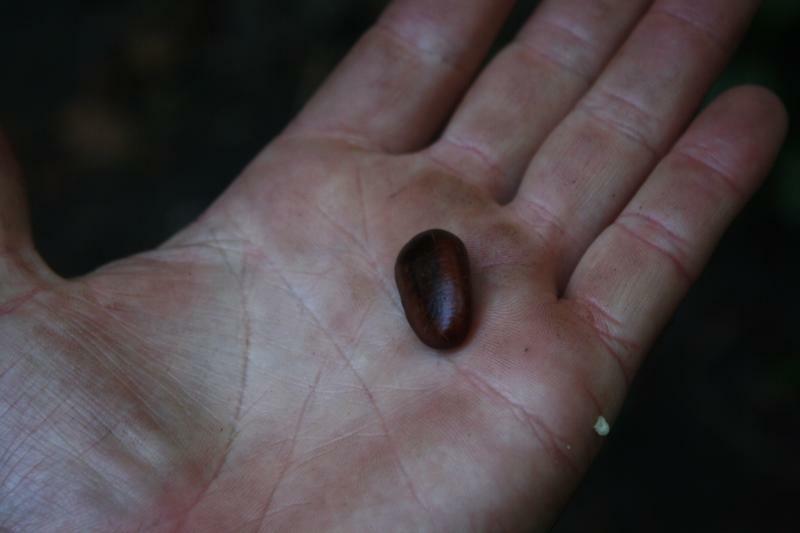 We had paw paws in our woods on our 24 acre farm where we raised our kids back in Ohio. This is so cool to learn about! Wait til I share with the kids! 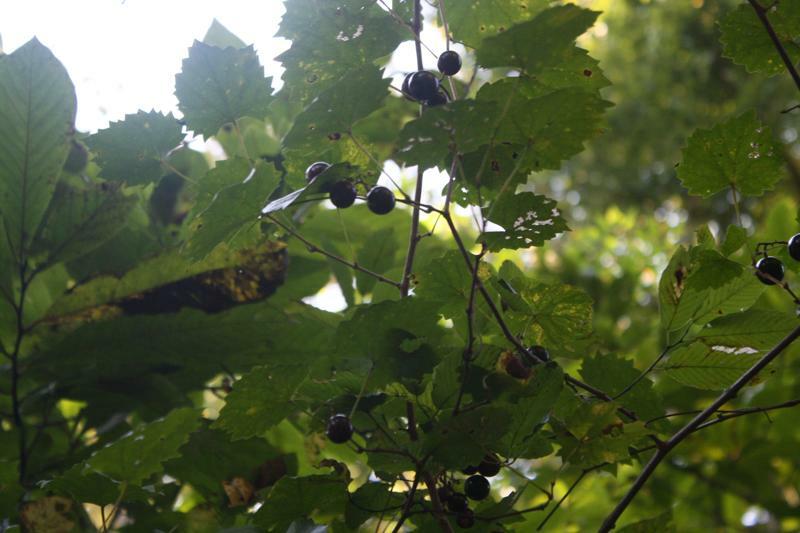 One of our best memories is waiting til fall to hike our beautiful woods, find the paw paws and eat them! Thanks for sharing! WHERE ARE YOU AND WHEN WILL YOU CROSS OVER? HOPE TO SEE YOU THIS WINTER!!!!!! Make sure you spend some time in Elizabeth City, the friendliest place on the ICW. I learned this song when I was a kid. I never knew what a paw-paw was until now. Super cool, Penny! We really enjoyed this fruit. Had a nice little visit in Elizabeth City…you’ll see! Bruce, this song is fantastic! I hope I picked a good tune for it as I serenaded Brian. Hi guys, you know in bermuda a PawPaw is totally different,ours are what most people call Papaya,but yours look yummy.Bring us some seeds! Too bad we don’t have them here! Love to read your blog.Thinking of you fondly. Keith & Elaine – it’s GREAT to hear from you both! 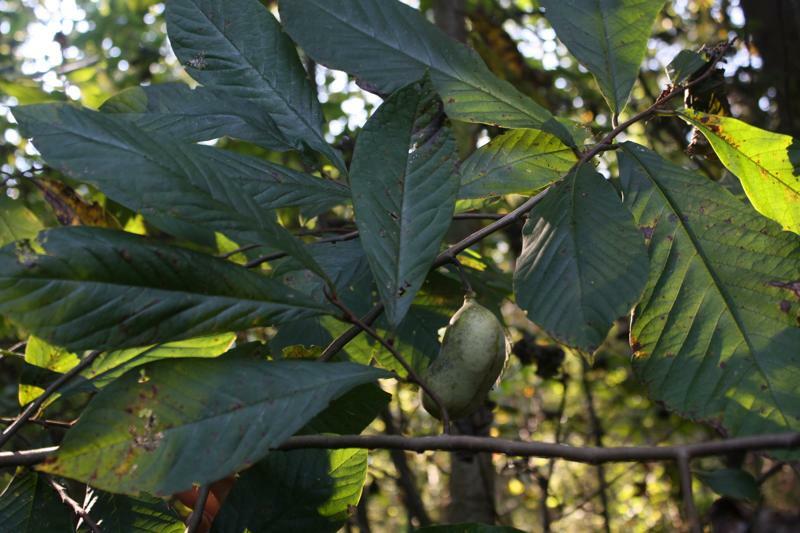 Thanks for sharing about Bermuda pawpaws…we sure do miss Bermuda! I’ll add pawpaw seeds to the list of items for when we return 🙂 Hope you are both fabulous!